Men in the military are often extremely fit and strong both physically and mentally. The armed forces must pass stringent regular health checks so you know a soldier’s sperm comes from a healthy body. Guy's in the military are often highly educated so these sperm donors carry the intelligence gene. Most soldiers are fit and healthy meaning they are more likely to have a high sperm count comparted to your average couch potatoes. Our armed forces consist of many young men. Young men have higher sperm counts and healthier motile sperm. If loyalty is an important factor when choosing your sperm donor qualities then choose a soldier. Loyal to their country and their team. 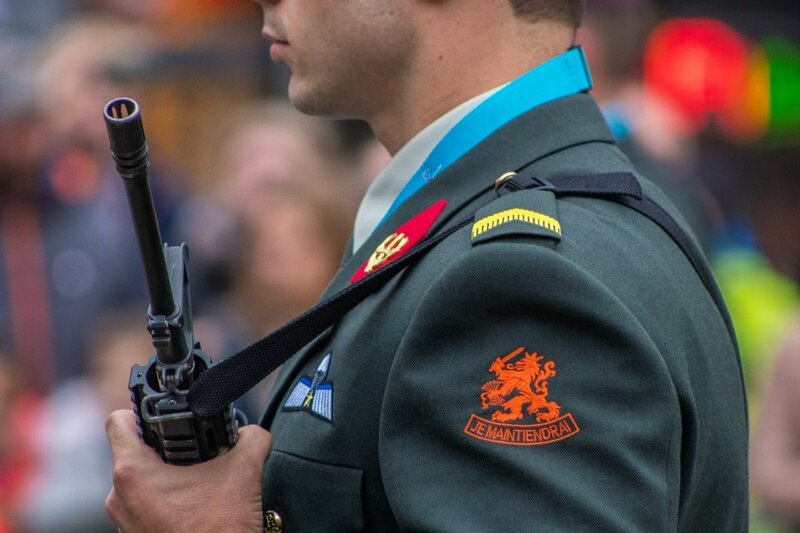 Many young men in the forces are honourable. What a great quality for your baby to inherit. Our young men in the armed forces are taught respect when they first sign up. Soldiers put their country before themselves, thinking of others at all times. Choosing a soldiers sperm means your baby will carry the hero gene. One would think there would be a queue of women lining up to snap up men like this, marry them and create beautiful children in a conventional relationship. However in real life it can be very difficult to meet that special person. Even more of a struggle if you are in the military moving from place to place. Time can pass by quickly, along with it the opportunity to have a steady relationship and in turn the opportunity to start a family. Men may not have a biological clock but they do have a strong desire to procreate. Men are no longer willing to sit back and wait year after year, decade after decade to become a father. This urge to become a dad is the reason that more and more military men are turning to sperm donation websites to fulfill their need to become a father. Modern sperm donor websites like Co-ParentMatch.com make it easy for men to specify if they would like to remain anonymous or be a known sperm donor or co-parent meaning they can be known to their child and involved in their child's life if they wish. Military men tend to have excellent health due to regular testing procedures, they are young, fit, secure and are most importantly absolute hero's. What's not to love? 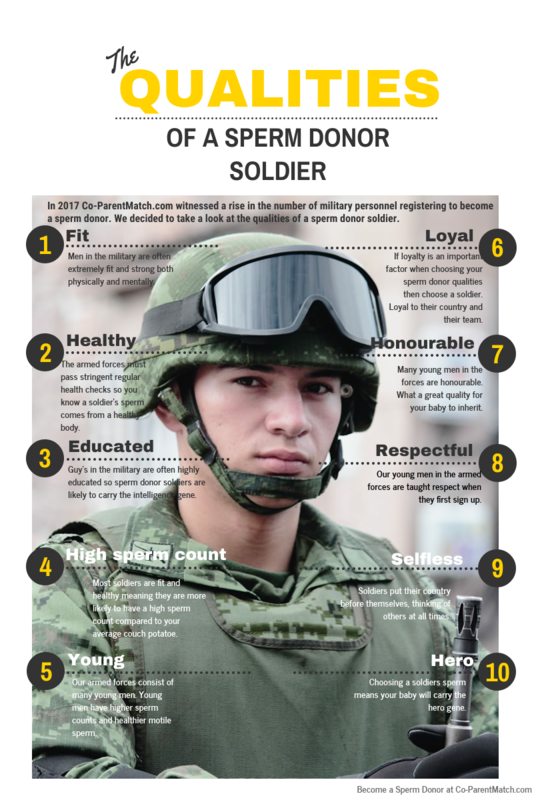 The sperm donation process for military guys is simple. Register an account, add a profile, start searching and receive email notifications of women looking for sperm donors like you. Here are a few examples of military sperm donors looking for women to help. Hello, My name is Robert, I am an American currently serving in the U.S. Air Force as an aircraft structural maintenance technician. I have been serving in England for 2 years already and live in Bury St. Edmunds. My job requires regular health check ups and blood work, which have always came back as a good bill of health. I work with many individuals designing diets and meal plans which means I also keep my diet very clean, only eating lean farm fresh meat, whole grains, and plenty of fruit and vegetables. In my free time I am constantly training, usually 4-5 days a week in the gym as I compete in power-lifting. I also do yoga at least 5 days a week. With the demands of my training I very rarely drink and when I do it is no more than one or two beverages. I have two degrees, one in civil engineering and another in aviation maintenance. Currently I am working towards my third degree in accounting since I plan to be a business owner after my military service. My family history also consist of very good health. I would be happy to answer any questions if interested. I have been in the marines for 6 years. We do medical screenings every month so being clean is not a problem!lol I love the idea of helping someone start a family. Knowing that I can give someone something they really want puts a smile on my face. I love serving my country and helping people. I am a very active guy and would love to give someone a child. I like meeting people and have a crazy high sperm count!lol I love being in the military but hate being gone from home. That's why I have not started a family yet. I'm open to most thing just let me know what you need. I am ok with the child knowing me when they get older if you wish. I would like to see what pretty life I have helped create. I only do PI and NI donations. I don't make test tube babies.